You may remember that back during General Surayuth Chulanont’s administration, seeds companies and those who support the cultivation of GMOs in Thailand took advantage of the fact that Thailand was governed by a military junta to bring in commercial trials of GMOs. However they did not succeed, thanks to the wave of opposition by civil society organisations, the Thai Organic Farming Association, along with those in the business sector whose exports be negatively affected by the decision. The Cabinet at that time sought to find a compromise by authorising GMO field trials on strict conditions, for example, they may only be trialled in government properties, there must be consultation with local people and public interest organisations, there must be an evaluation report on the impacts on health and the environment. In addition, each case must be authorised by the Cabinet on a case-by-case basis. An important rationale behind this Cabinet Resolution was there had been two cases of GM contamination into agricultural fields during the period of trials. These were contamination from GM cotton by the Monsanto company in 1999, and the case of contamination from GM papaya by the Department of Agriculture together with Cornell University in 2004. The latter has brought about a lasting effect on the country up till today, as we know that Japan and the European Union have returned exports of Thai papaya in large quantities ever since they found GM papayas. So when the military government took power once again in 2014, the transnational seed companies, and the giant seed corporations of Thailand, came together to push for GM crops one more time. They hoped that under the present undemocratic state of affairs and the limitations on people’s freedom of expression, they would finally be able to succeed in their goal, after having failed every year since 1996. Just recently, the Director General of the Department of Agricultural Extension and representatives of the Monsanto company, who are in the joint sub-committee to develop a strategy for 4 economic agricultural crops, i.e. maize for animal feed, cassava, oil palm, and sugarcane, under the chairmanship of General Chatchai Sarikalya, Minister of Commerce issued a statement saying that this subcommittee will propose that the government should authorise trials and commercial planting of GMOs in Thailand. However, there has been opposition from many sides, which has prompted General Chatchai to order additional studies on this issue. He has set up a Working Group to study approaches for using genetically modified life-forms and products in Thailand on 16 September 2014. This Working Group had its first meeting on 30 September 2014. The majority of the 21 Working Group members are from government agencies, and private sector groups. Ms Jeerawan Yemprayoon, Deputy Permanent Secretary to the Ministry of Agriculture and Cooperatives was appointed chairperson, with Mr Suwit Chaikiartiyot, Deputy Director of the Department for Agricultural Extension as Secretary. 1. The invitation letter was only issued on 29 September 2014 for a meeting on 30 September 2014, without any prior notice at all. Therefore many government agencies were not able to participate in the meeting such as, the Food and Drugs Administration (FDA), and representatives of Office for Natural Resources and Environmental Policy (ONEP). Many of the government agencies which have concerns about GMO crops did not have the opportunity to prepare any documents to present at the meeting. 2. The chairperson of the meeting, Ms Jeerawan Yemprayoon, Deputy Permanent Secretary to the Ministry of Agriculture and Cooperatives, who was due to formally retire from the civil service on the day of the meeting, tried to cut short the deliberations to develop a research plan, in order to be able to prepare for GMO crop field trials in accordance with the proposals of the transnational seed corporations. She did not show any interest in, nor give any importance to, the first of their main responsibilities set out in the Directive setting up the Working Group, that is to study the technical, economic and social feasibility of using GM crops and products in Thailand. 3. It is worth noting that during the meeting, the Chairperson allowed Monsanto company representatives to present a 40 minute presentation to persuade the working group to approve the cultivation of GM crops. This amounted to 1/3 of the entire timespan of the meeting. Some of the slides presented appeared as if they had been prepared by the Secretary of the Working Group. 4. The working group members which were appointed included a total of five representatives from private sector organisations (including a representative from Monsanto, who attended the meeting as representative of the “Thai Seed Trade Association”). 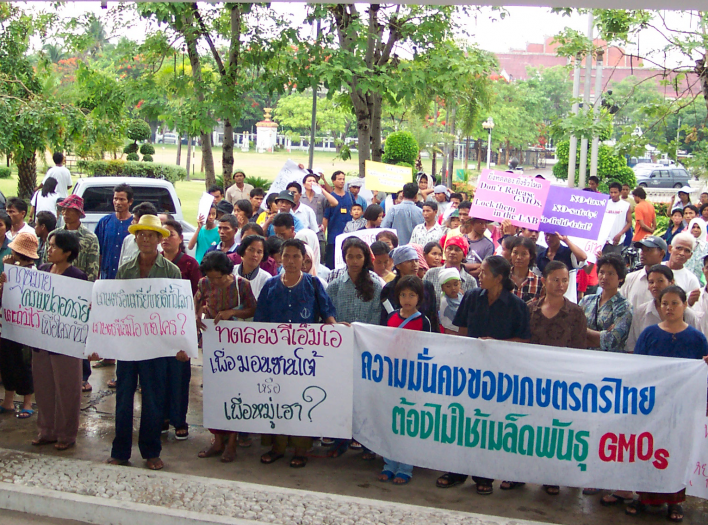 There were no representatives from civil society organisations such as, for example, consumer organisations, the alternative agriculture network (although BioThai was invited) nor from any of the private sector organisations who are concerned about the impact of GMOs, such as, the Thai Organic Farming Association. Each of these groups have had an important role in making policy proposals on GMOs in Thailand. After a broad discussion, during which BioThai and the National Council of Farmers insisted that the Working Group must study the economic and social impacts of GMOs. Suwit Chaikiartiyot, Deputy Director of the Department for Agricultural Extension, in his capacity as Secretary to the Working Group concluded the meeting by saying that there will be 3 to 4 further meetings prior to making a presentation to General Chatchai Sarikalya. The next meeting will present the findings of the technical economic and social study on GMOs for consideration. This will also consider the research methodology and the criteria for the preparation of experimental cultivation of GMOs. to bolster their political power, the Thai government under the leadership of General Prayuth Chan-ocha looks highly likely to decide to plant GM crops commercially in Thailand for the first time.